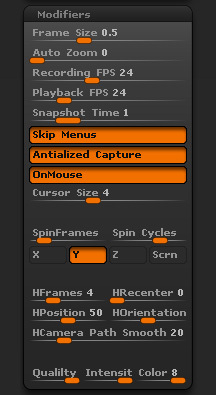 The Movie > Modifiers sub-palette contains recording and playback options. Factor by which the actual recorded images will be scaled to produce the final movie. To minimize the amount of space your movie takes, set this just high enough to show the amount of detail you need to show. When any value other than 0, only a portion of the window or document will be shown, and the camera will pan to follow the mouse. The size of the area around the mouse that is shown is determined by the value of this slider. There’s a certain amount of tolerance built in; small mouse movements won’t cause the camera to pan, which reduces unnecessary panning. Number of frames per second used when recording the movie. Small values reduce the movie file size, but result in a jerkier animation. Determines how quickly the movie will play back. If this is equal to the Recording FPS, the movie will play at the speed it was recorded at; if this is double the Recording FPS, the movie will play at double speed; and so on. When inserting a snapshot into the movie using Snapshot, determines how long the snapshot will be visible when the movie is played. When on, menus will not appear in the animation. Antialiases output, at possible cost of increased processing time, blurring of pixel-level details, and perhaps a small effect on file size. Normally this should be left on. When OnMouse is active, then the movie will record only those actions that occur when the mouse is active. Basically, this means that clicks on controls, and sculpting and moving the model will be shown, but not movements of the mouse around the screen or over controls. Can be used to increase the size of the cursor used in the movie, which can make the cursor more noticeable is situations where it would otherwise be difficult to see. The number of frames that will be used for a full rotation of the model. This setting, together with Recorded FPS, determine how quickly the model will appear to rotate. Determines how many times the model will rotate before the rotation stops. You can interrupt the rotation by performing another action. Controls axis of rotation to the X axis. You can activate more than one rotational axis at a time to tumble the model, but using only one at a time to rotate the model is probably more common. Controls axis of rotation to the Y axis. You can activate more than one rotational axis at a time to tumble the model, but using only one at a time to rotate the model is probably more common. Controls axis of rotation to the Z axis. You can activate more than one rotational axis at a time to tumble the model, but using only one at a time to rotate the model is probably more common. When on, the axes of turntable rotation are screen axes, not model axes. The HFrames slider defines the quality of the transition between each recorded history operation. A low value will create a movie with no interpolation. A higher value will create a movie with better interpolation between operations, similar to a blending transition between your sculpting strokes or operations. Increasing the HFrames setting will have an impact on the movie recording time and the final movie playback speed because of the extra frames required to create a smoother movie. The HRecenter slider defines how much the mesh will be re-centered on the document. A high value will keep the mesh at the center of the document while a low value will follow approximately the position of the mesh during the creation process. The HPosition slider defines how much the original mesh position will be maintained as the model was moved and scaled during sculpting. A high value will keep the mesh position similar to what it was during the creation process while a low value will minimize the mesh movements and create smoother playback. The HOrientation slider defines how much the original mesh orientation during sculpting will be captured in the movie. A high value will keep the mesh orientation similar to what it was during the creation process while a low value will reduce the mesh orientation and create smoother rotations during movie playback. The HCamera Path Smoothness slider defines how smoothly the camera path will be interpolated. A higher setting will have a smoother interpolation of the camera from the original movement during the creation process. Note: If you wish to have no camera movements for your recording set the HOrientation, HPosition and HRencenter to 0. You must also set the Movie > Modifiers > Spin Cycles to 0 and Spin Frames to 1. The Quality slider controls the compression of the movie. The Intensity slider controls the intensity quality of the movie. It is recommended to only adjust the Quality setting. The Color slider controls the color range of the movie. When set to a lower level the color range will be set low and generate a movie with a color range of 16BIT. If the slider is set higher then the color range will be 32BIT.